Advocates for Human Potential, Inc.
There’s something exciting about the fresh start of a new year, a new calendar, 365 fresh days to do anything you want. We’re bombarded with headlines telling us this is going to be our year: New Year, New You! How to Make 2017 Your Year! One Year to an Organized Life! Transform Your Life This Year! The possibility is exciting, but I have to be honest—I also feel a lot of pressure this time of year. Did I choose the right resolutions? Will this be the year I finally fix everything? Is my year going to be transformational enough? I spent many years making loooooong lists of resolutions—dozens of them. I’d throw myself into ten or more big self-improvement initiatives, and I’d get myself completely overwhelmed and burned out by the end of the first week. And then I’d feel like I failed, like I was wasting my new year and my fresh start. 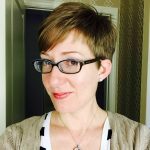 It was not a productive cycle, and it helped me stay stuck in patterns that weren’t serving me well. Then, I found WRAP—a tool to help me make my life how I want it to be at any time. Some people choose to make a new WRAP for different aspects of their life and their wellness. Some people have a separate WRAP for work and WRAP for their personal life. Maybe you have a WRAP for your mental and emotional health and a WRAP for a physical health issue like weight management, diabetes, or quitting smoking. For me, a single WRAP works best right now, so that’s the perspective I’m sharing from. Instead of making a massive list of resolutions of all the ways I’m going to “make this year my year” on January 1, I consider this question: What do I want my WRAP to help me do? This is not just for the new year! I ask this question any time I feel like I need a wellness reboot, and I update the list every few months. I keep this list in the front of my WRAP binder, before my Wellness Toolbox. One of the things on my list of what I want my WRAP to help me do is improve my health. When I made traditional new year’s resolutions, “improve my health” was where the thought process stopped. Using my WRAP, though, I broke this idea down further. Here’s a snapshot. What do I look like when I’m feeling healthy? I wake up the first time the alarm goes off, I have a lot of energy, I sleep well, I don’t have food cravings, I don’t need a nap, and I enjoy exercise and do something active every day. What must I do each day to feel healthy? Do some exercise first thing in the morning (this is very important to my overall wellness, not just my physical health), drink three big cups of water from my red cup, sleep at least seven hours, stretch or do some yoga at least once during the day, avoid sugar, and limit caffeine to one serving. What might I do each day or some days to feel healthy? Go running at the nature preserve, go to a class at the YMCA, do a 30-minute yoga video from my yoga app, and/or eat an extra snack. For any of these answers that are not in my Wellness Toolbox, I add them there as well. It’s up to each person how detailed to make this Daily Plan and whether to make it at all. For me, it’s very helpful—especially when I first wake up because I am not a morning person! I need my Daily Plan to tell me what to do and when or I’ll roll over and go back to sleep. It also helps me at bedtime to make sure I’m set up for success the next day before I go to sleep. Then, I look at my Triggers and my Triggers Action Plan and ask myself what might make me go off track. A big one for me is oversleeping, which can cause me to miss my morning workout, which for me throws off my whole day. So, if I experience the trigger of oversleeping, my action plan is to take three deep breaths to help myself let go of being frustrated, drink a big glass of water, and do any exercise I have time for even if it’s not what I planned to do. Even if it’s five jumping jacks in the bathroom while I wait for the water in the shower to get hot, it still gets my blood flowing and helps me get in the right mindset for the day. Then, I look at the triggers and ask myself what I can do to help prevent them. For the trigger of oversleeping, I can make sure I go to bed at a reasonable hour and I can set a backup alarm on my phone to make sure I wake up on time. I add these preventive steps as part of my Daily Plan. I won’t go through all of these in detail, but I look at each of the other parts of my WRAP with my “resolution” in mind. For instance, a sign that things are breaking down is that I miss three days of workouts in a row. An action step I would take at that point is making plans to meet a friend for running for the rest of the week to help me be accountable. We want to hear from you. Do you make new year’s resolutions? If so, what are some things you’re working on? Have you updated your WRAP to reflect any new goals for 2017? Or did you make a new WRAP for a new focus area or project? Please visit our Facebook page and tell us how you’re using WRAP to support your wellness and your goals this year. Like, share, and comment on our post (on Facebook and embedded below)—we’d love to include your comments in a future issue of this newsletter. If you’d like support creating your first WRAP or updating your WRAP, here are some resources you may find helpful. Find a WRAP facilitator in your area to locate a local WRAP group. Attend a WRAP Seminar I online (next session begins January 11, 2017). In the Seattle, Washington, area? 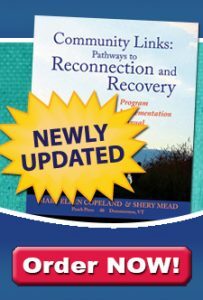 Attend a workshop with Mary Ellen Copeland, PhD, at the National Council conference in April (“Your Personal Wellness Recovery Action Plan (WRAP)” under half-day universities). Take the WRAP Correspondence Course. Use the WRAP Red Book (original WRAP), Blue Book (WRAP for Addictions), or any of our other WRAP books to work on your own WRAP independently. If you’d like to help others benefit from WRAP, learn more about becoming a certified WRAP Facilitator.